One lucky punter in France has picked up the 15 million euro jackpot in the inaugural draw of a European lottery. 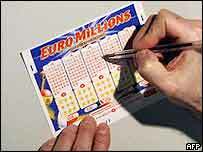 The winning numbers in the Euro Millions game were 16, 29, 32, 36, 41, with Lucky Star numbers 7 and 9. France's TF1 television channel said the winning ticket was bought in the central town of Bourges. The draw had taken place near Paris. The new game is being run by a consortium of lottery operators in Britain, France and Spain. More countries could join next year. Tickets cost two euros - £1.50 in the UK - and the organisers say jackpots could reach more than £50m. The draw takes place every Friday evening.